Oh no! The Virginia Snakeroot babies are all gone! 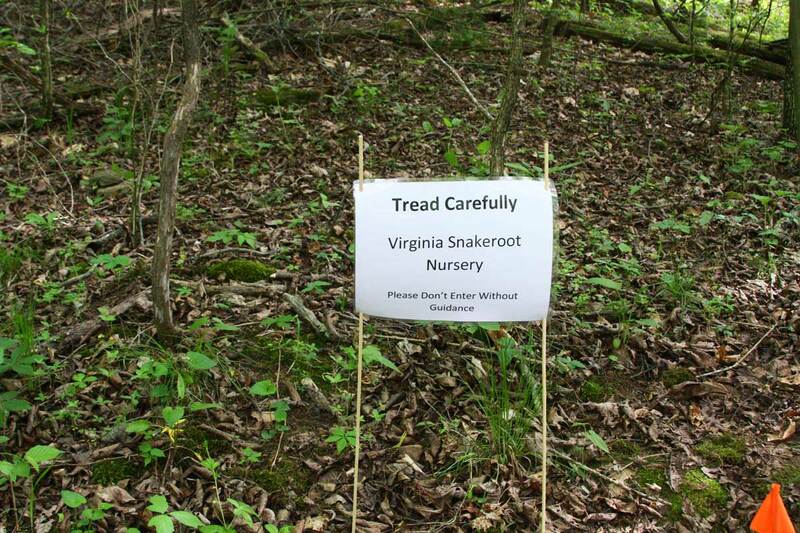 I went out to check on the Virginia snakeroot nursery the other day and was mortified to find nothing. Not. One. Plant. Virginia Snakeroot … What’s That? Now, you might be wondering just what’s so important about a plant that really looks like nothing much more than a weed in the woods. It’s a plant of interest to me for a couple of reasons. 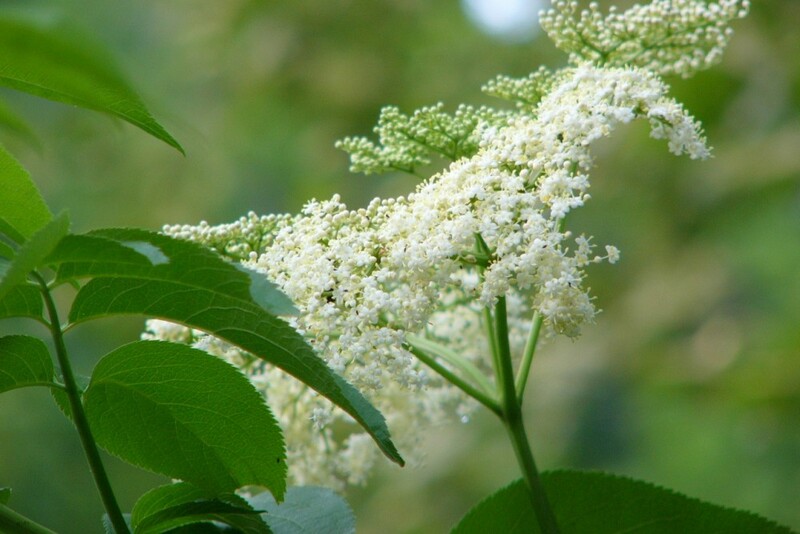 First, it’s a medicinal plant with a history of being used to treat snakebites and mad dog (rabies). I’m not likely to use it for either of these, but I do have an affinity for medicinal plants. Second, it’s harder and harder to find because there’s actually a market for the roots. People dig them and then sell them to botanical purveyors who then sell them to pharmaceutical or herbal companies. There’s another plant that has very similar leaf shape, but it isn’t snakeroot. Not Virginia snakeroot. Not sure what it is, but I know what it isn’t. There’s a long article on the plant and how it was once used at the Herbs2000.com website. For the past several years I’ve searched our property for this plant and never could find any. In 2015 I found the first plant, but then a major flash flood erased it from the site. Then last year while I was making trails in the Ginseng Habitat Demonstration Garden, I noticed a whole mess of the plants on a little knoll under the cedar trees. I was so excited. I’d even placed a sign at the entrance to warn visitors not to enter that part because there were so many it would be hard to walk around them without stepping on some. I wanted to collect seeds and propagate more of them. And now they are gone. Completely disappeared. The ground had been disturbed by an armadillo, but I don’t think an armadillo would eat snakeroots. I didn’t see any footprints that might indicate some roaming root digger had come by. Virginia snakeroot is one of the wild plants that botanical buyers purchase, but these plants were so small it would take a ton of the little roots to earn the $30 or so per pound that they can fetch. Besides that, there were ginseng plants in the vicinity and I can’t see a poacher taking the snakeroot without also taking the ginseng. I think I figured out the answer. Or more specifically, caterpillars of the Pipevine Swallowtail. These butterflies are not the pollinators for Virginia snakeroot, but the pipevine plants are the host plants for their larvae. Virginia snakeroot is one of the pipevines, as is wild ginger and Dutchmen’s pipe vine. While we have lots of wild ginger around, we don’t have many of the Dutchmen’s pipe and I’ll bet what happened to my plants is that they were eaten by the larvae of butterflies. Actually, they weren’t ‘my’ plants. I’m sure the butterflies were excited to see them and call them theirs, too. It’s the explanation that makes the most sense. If that’s the case, they’ll be back next year. I can find a way to protect a few plants and share the rest with the butterflies. Keep your fingers crossed! The flower isn’t mature yet in this photo. It was when I went back out there to get another photo of the flower that I noticed they were all gone. There are ginseng seedlings coming up early this year, at least in Yellville, Arkansas. 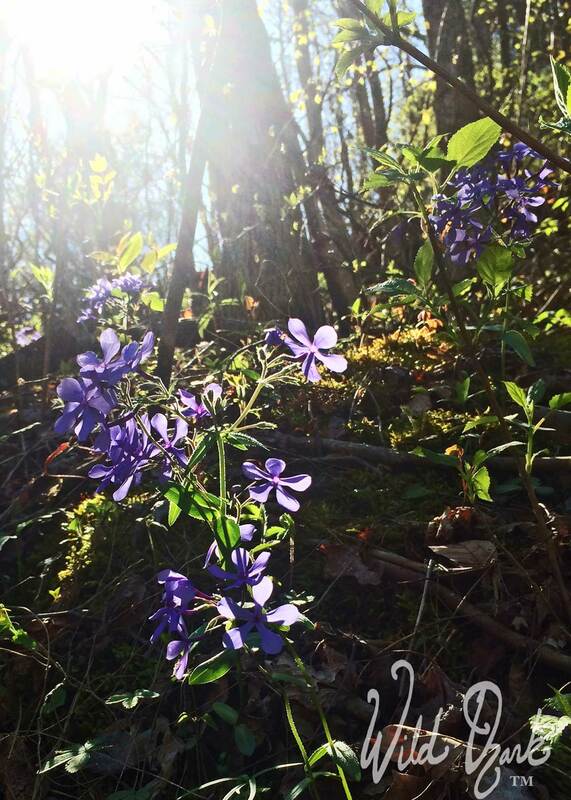 I haven’t seen any here at Wild Ozark, yet, but a few hours to the east, my friend Suzanne is reporting that hers are all coming up already. Here’s a pic she sent this morning. I’ve never had them come up before bloodroot and Suzanne reports that her bloodroot hasn’t bloomed yet, either. How about any of you out there? 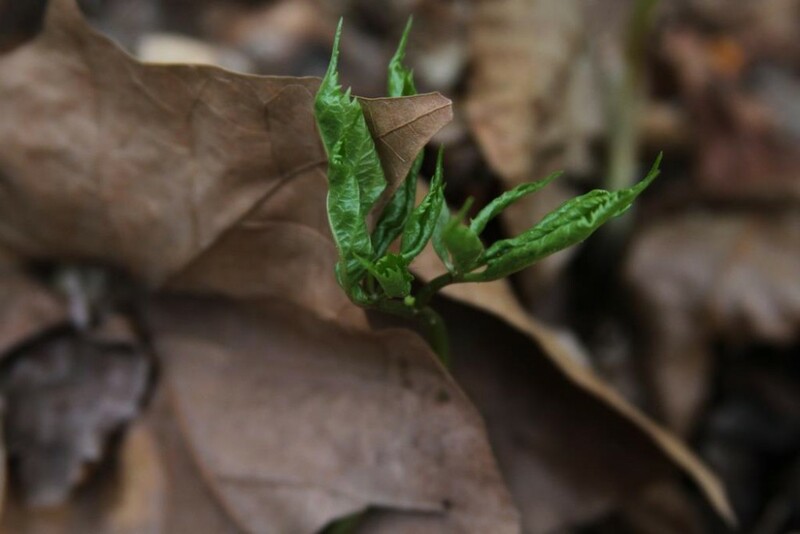 Have you noticed your ginseng seedlings coming up early too? Let us know and send pics if you want! I’ll have seedlings at the Huntsville farmer’s market and possibly the Fayetteville market beginning in May. This year I’ll also try shipping them, but if the first attempts result in damaged or unhealthy plants, only local pickup will be available. I’ll refund any damaged orders. Vernal Witch Hazel Flowers and Hazelnut too! Today I went out to take cuttings from the Ozark Witch Hazel in the hopes of rooting them. I wasn’t looking for an American Hazelnut, but that’s what I found! I found the Witch Hazels, too. But I already knew those were there. New finds are always so exciting to me, but I think most people probably think I’m a little strange to be so thrilled over finding a plant. While I was scanning the creeksides for the witch hazel blooms, I happened to notice a small tree/large shrub on the uphill side of the road. On the opposite side of where I knew the witch hazels to be. From a distance, it looked a lot like it was covered with the American hazelnut male flowers that I saw on Steven Foster’s FB post the other day. My heart beat a little faster and I got out to take a closer look. Sure enough, there were the ‘catkin’ male flowers. Male and female flower of the American hazelnut. The female is that tiny little frilly thing at the tip end of the branch. Now, to see MUCH better photos, take a look at Foster’s. I poked around in the bushes for a bit and found one of the hazelnut shrubs that still had a leftover nut on it. The nut was tremendous in comparison to the small ones produced by the witch hazels, but it is still a fairly small nut compared to the ones you’d buy in the stores around Christmastime. Smallish or not, I’d be willing to crack and shell them if I could gather enough. In fall, the new crop of nuts will be on the tree and you can bet I’ll be there trying to get them before the wildlife. The hazelnut and husk, straight from the tree. I’ve lived here 13 years now and never noticed this small tree. I know it’s been there longer than I’ve lived here. It always surprises me when that happens. I just this year saw the biggest beech tree I’ve ever seen out here and it obviously has been there fifty years or more. Same thing happened with a deciduous magnolia. Found it, for the first time, last year right on the side of a trail I commonly use, and it too has been there probably fifty years. Who knows how many more as-yet undiscovered plants are out there waiting on me? The Vernal Witch Hazels are also known as Ozark Witch Hazels (Hamamelis vernalis). They bloom in late winter or very early spring (hence, the ‘vernal’ part of their common name). We have another variety called simply ‘Witch Hazel’ (H. virginiana) that blooms around October. Those have yellow flowers. The vernal ones have maroon and yellow flowers. I think I almost missed the blooms on these this year. Or maybe they’re just getting started. I’ll have to check again in a day or two and see if the flowers are more developed, or completely withered. I don’t really do anything with the Witch Hazel medicinally. They’re good for making an astringent wash to treat hemorrhoids and they make a good facial tonic. I just like the flowers and it’s one of my annual ritual photos I like to take to mark the passing of time. If in the future I need to use them for a remedy, I know where to find them. When I finished getting my pictures, I took some cuttings and will try rooting them to see if I can make new plants from them. I tried this last year, but it didn’t work. Ever the optimist – that’s me. I’ll keep trying. Have you ever tried eating the American Hazelnuts or using the Witch Hazel? Let me know how it went. When I was a teenager I used to use the Witch Hazel tonic for acne, but I’m not even sure they still sell it on the shelf like they used to do way back when. What is Nature Farming? What does a Nature Farmer Grow? What I mean by ‘Nature Farming’ is not the same as ‘natural farming’, ‘organic farming’, or ‘natural farming methods’. Explanations for all of these things come up when you do a search online for ‘nature farming’. But nothing turns up for true nature farming. Hopefully this post will show up in the search engine results list soon. I am literally farming nature. I’m not doing conventional farming using natural techniques, or practicing organic or permaculture farming (although where I do actually grow things on purpose, I do adhere to those principles). The more people who interact with my blog, the more quickly it’ll turn up in searches online. Will you help me get it noticed by sharing this post? What I’m farming is already present there in nature. For the most part, the plants I use in my business already grow here naturally. I encourage some of them to multiply by dividing or transplanting or seeding them in more areas, but the habitats to support them already exist here. No tilling involved, though sometimes I do make nursery beds by creating rock wall terraces on the hillsides. The terraces are in the deep shade under trees with the kinds of leaves that make good mulch for ginseng. They keep the pots from washing away during rains and when the creek floods, provides easy access for seedlings when I need to fill orders, and is a staging/holding area for the items I bring with me to market. A ginseng habitat in a pot! This one includes a 3-year old American ginseng with a handful of companions for $75. Available only for local pickup at the nursery, or the farmers market booth (check schedule). Reserve in advance to make sure I have one with me by emailing [email protected] Bare root collections can be shipped in fall. American ginseng seedlings are the main things that use the terraced beds. I transplant the seedlings to the other habitats and I also put them in pots sell them at market. When it’s not growing season, I sell them as dormant, bare root plants. Wild Ozark is the only certified ginseng nursery in Arkansas. Wild ginseng lives here naturally, and I’ve purchased seeds to grow even more of it. I keep the wild populations separate from the wild-simulated. When I say ‘wild-simulated’ that means I’m growing the ginseng in the same way it would grow in the wild. All I do is plant the seed in a space where it can flourish. I do have one small area set aside as a teaching environment. It’s my Ginseng Habitat Demonstration Garden. It’s not quite a natural area yet, because it is still recovering from being logged many years ago. As the trees get bigger it will return to a natural dense shade forested habitat. In addition to the ginseng seedlings and habitat pots, I also keep many of the companions in propagation beds so I can easily transplant them to pots and sell them, or harvest bare root plants for dormant shipping. Those plants include goldenseal, bloodroot, black cohosh, blue cohosh, a variety of ferns, spicebush plants, pawpaw tree seedlings, and doll’s eyes. I also keep some of my other favorites like trillium, Dutchman’s breeches, and trout lilies, too. The Ginseng Habitat Demonstration Garden is not left completely to nature because I’m taking out things like honeysuckle and wild roses. I’m thinning some of the trees I don’t want there to favor some of the ones I do. The reason for that is to speed up the process that will make it a better habitat for the American ginseng and the companion plants that also grow in the same sort of environment. While the rest of Wild Ozark is pretty much left up to the stewardship of Mother Nature, this demonstration garden is being tended by me. While the garden isn’t an ideal environment yet for the ginseng, it will eventually be so and the plants are doing well enough in the meantime. My process of doing this is helpful to others who want to do the same thing on their own property. Additionally, and the main reason I chose this spot, is because it is in a location close to the front gate and I don’t mind sharing that location with visitors. I harvest things provided by nature. Things naturally growing, dropped to the ground, or dried on the stem. Wildcrafting is the gathering of wild plants. I’ll make ointments or extracts and teas from the medicinal plants. Some of them I’ll sell, and some of them I keep for our own household use. The parts I gather include fruits (persimmons, pawpaw), flowers (echinacea and beebalm), berries (elderberries, spicebush berries, raspberry, blackberry, etc. ), seeds (lobelia), nuts (hickory, acorns), stems (witch hazel) or roots (ginseng, goldenseal). So here’s where my nature farm departs from what most people normally think of when they think ‘farming’. The bulk of what Wild Ozark produces is botanical items most people barely notice. Usually it’s lying on the ground in the process of decomposing so it can return to the soil. Sticks, vines, leaves, bits of bark that fell from a tree… all treasures to me. These harvests include things I use in my arts and crafts, like mosses and lichens and bark. These are things I simply pick up and put in my bucket during my morning walks. I use all of these things to create my Forest Folk, Fairy Houses, and Fairy Gardens. These are very popular and I even hold workshops on how to make these things so anyone can learn how a bit of nature farming can lead to beautiful Nature Art. I sell the small ferns for fairy gardens, bags of moss and preserved leaves, too. You can see where I’ve used twigs, acorns, leaves, dried grass, moss and small ferns in the following photos. “The Wild Ones”, a pair of Forest Folk musicians and a dancer. A wee little fairy house made from Wild Ozark nature farm botanicals. At a Forest Folk Workshop, if the table isn’t messy, we’re not having enough fun. One of our Nature Farm harvests is the bark of a certain tree. Burnt Kettle, my husband’s company, uses the bark from Shagbark hickories to make a delicious syrup. These trees grown naturally all around here. Eventually we’ll harvest the wood from certain trees for my husband’s woodworking projects. He needs a bandsaw and sawmill to make boards from the abundant cedars that grow here. Art, photography, stories and workshops. Being around nature all of the time inspires me to write, draw, and take photos. I love sharing what I learn and enjoy with others, so I’m always happy to be contacted about doing workshops on topics like nature journaling, ginseng growing or habitat identification, and creating nature art. I’m not an expert on photography, so I’ll leave workshops on that to the ones that are. The outstanding photos from the ones I take are available for sale but I don’t have most of them listed at the shop yet. Thanks for visiting with Wild Ozark website and taking the time to read about what I do here. Come by and visit the Ginseng Habitat Demonstration Garden if you’re in the area during spring and summer or come by the market booth to see the Forest Folk and Fairy Gardens! The market schedule will be kept current so you’ll know where I’ll be and when, but you can always email in advance if you like. Click here to get all of my contact information. So last summer I noticed an armadillo had moved into one of the ginseng nursery beds. It’s been a destructive force in the area since it arrived a couple of weeks ago. I wrote this post while trying to decide what to do the situation. I thought it would be a good time now to update and let everyone know the outcome. What would you do? Kill the armadillo or let it live? Why a dilemma to me? First of all, I don’t like to kill anything unless we’re going to eat it. I’m not going to eat an armadillo. But the armadillo is causing havoc. 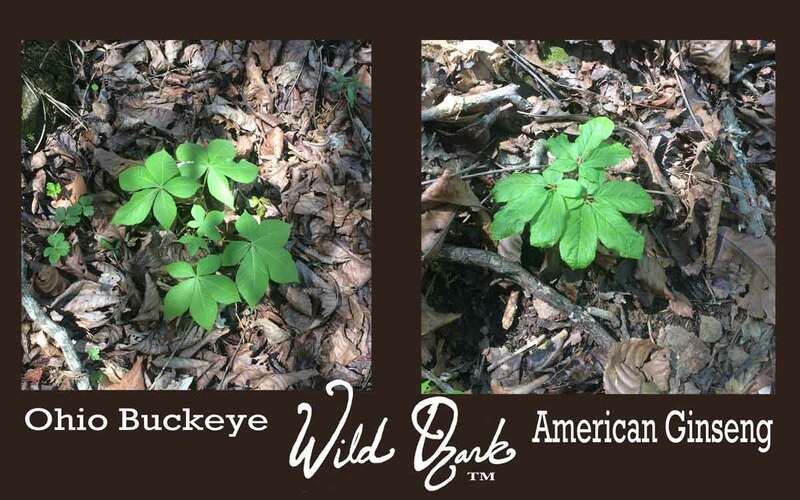 Wild Ozark grows wild-simulated American ginseng, which is indistinguishable from wild except on a genetic level. The critter isn’t eating the ginseng, but the earthworms that live in the ginseng patch. If I let this go and allow Nature to determine what happens next, the armadillo will continue to tear up ginseng rootlets as it hunts earthworms at night. Armadillos are not native here. Neither are the earthworms. Am I native here? At least on a human-level, I think I am. There is evidence that humans lived here many thousands of years ago. Not so for the cute little leprosy-hosting armored bandits. They migrated up from Texas, along with their road-runner friends. At least the earthworms are beneficial and don’t harm the plant that is the basis of our livelihood. But the armadillo is also eating grubs, which are the larva of an insect (Japanese beetle) that also isn’t native. And the grubs do eat the roots of plants possibly including the ginseng. So it could be doing me a service even if it is very destructive in the process. As a side-note, there’s no need to worry about the leprosy unless you’re cuddling armadillos. You can’t catch the disease just by inhabiting the same piece of ground. If you tend to eat armadillos, be sure to cook the meat thoroughly. There have been cases of it caught from undercooked armadillo meat. Our nine-banded Armadillos are the only mammal that can host the leprosy bacteria that has plagued humans for centuries. They’re used to study the disease in laboratories. I once turned down what might have been a very interesting lab job at Carville, Louisiana where leprosy is studied on the campus of what used to be the last remaining Leper’s Colony in the United States. The laboratory has since moved to nearby Baton Rouge. If you do tend to play with wild animals, however, I’d leave the armadillo off of your list of critters to cuddle. Just in case. At least leprosy can be treated nowadays. But that’s about as comforting to me as knowing that I can get rabies shots if I’m bitten by a rabid animal. I’d just rather not. If I kill the armadillo, then I have interfered with Nature, right? If I don’t kill it, maybe it’ll help cut down on the Japanese beetle problem. If I let the it live, then it will likely produce offspring, if it hasn’t already. Then those in turn will turn up even more of the nursery beds. Even if it eats every last one of the grubs it’ll never run out of earthworms to devour. The grubs aren’t so much of an issue in our woods. The earthworms are doing a helpful job. I feel that I myself am a natural part of Nature, and therefore have a right to defend territory I’ve marked as “mine”. I’ll tell this to the invader later today. Then it can either leave or stay and face the consequences. First I’ll try the live trap and relocation. If that doesn’t work, it’ll be on the hit list. Update 2018: This past summer we had the largest invasion of japanese beetles I’ve ever seen here. I decided to leave the armadillo alone. Although many areas were uprooted and the ground was turned up, I did not notice a significant amount of loss of seedlings or mature plants. That armadillo probably ate more than its weight in japanese beetle grubs, though, and for that I am thankful. And willing to sacrifice a few plants. Oh, my … GINSENG JELLY! Both are delicious, but you’ll get more of the ginseng active ingredients from the Gold. Prices do not include shipping. This jelly is intended for adults only. A teaspoon a day is plenty enough to experience the benefit. UPDATE 2017, made a fresh batch of jelly for this year: it is delicious and potent!! Getting ready to chop the ginseng roots after soaking them for a couple of hours. I tasted the decoction (broth) this morning after it soaked overnight and the flavor is bitter with a sweet follow. This is exactly how the roots taste when chewed. The jelly is sweet, lightly flavored with a very slight bitter finish. Some people don’t taste the bitter at all, but I do. The point with this product isn’t so much to use it as a confection, but as a tonic. My favorite way to use it is on my morning slice of toast. That’s all you need – a teaspoon a day. If you take it daily, then the little jar won’t last very long. This is a good thing, as ginseng shouldn’t be used on a daily basis for more than a month or two at a time. Ginseng has been in use as a medicinal plant for thousands of years. American ginseng was first used by the Native Americans but became popular in China during the 1700’s. In recent years scientists have become more interested in the ways ginseng works and have produced several studies. Here’s an article about the effects of ginseng. And, here’s an article about some of the side effects of ginseng and possible drug interactions. You should always do research before using herbal remedies, and do more than just read the links on mine or any other one site. This jelly contains a broth made with American ginseng root. A large portion, if not most, of the medicinal part of ginseng is water soluble, so it will be in this jelly. Look for Wild Ozark American Ginseng Jelly at the Nature Shop and at our market booth this year! It’s pretty and tastes wonderful! “Ginseng Gold”, which is just ginseng, and “Ginseng/Apple”. Both are $25, but with the Ginseng/Apple you get twice the volume. Email me at madison(at)wildozark(dot)com if you want some. Caring For, Finding, Growing, Digging and Selling Ginseng – These are Wild Ozark’s most often asked questions about ginseng. I’m always learning more about this fascinating plant, so if you have opposing information please post in the comments. If you have other questions, post those too! 1. Why can’t I find ginseng? Most often the answer turns out to be that the person was looking in the wrong kinds of places. Once the right habitat was discovered, then the problem is that the plant is just very hard to spot. Sometimes, even if the habitat is correct, the problem is that there just isn’t any or very many ginseng plants growing there. It is often completely harvested by poachers or overharvested by previous land-owners or diggers. At least when the right habitat is found, you can always plant some and start a new patch. For a more in depth response to this question, click here. 2. Can I dig in one state and sell in another? 1. Any person, business, or corporation who buys wild or artificially propagated American Ginseng for sale across state lines shall be termed a dealer by intent of Act 774 of 1985, and shall obtain a Ginseng Dealer License and a Certificate of Legal Taking from the Arkansas State Plant Board. 3. When should you plant ginseng? In late fall, before the ground begins to freeze. Out here (northwest Arkansas) the ground never freezes solid long, so I’d also plant during winter on days that aren’t too cold. Usually, though, I like to have all the seeds planted by end of October. 4. Where do I sell my ginseng? Check around September on the windows of stores in the small towns of your area. Buyers will often post notices to say when they’ll be coming to town. You can also check the classifieds of your electric coop magazine (if you get those out there). Fur buyers will often buy ginseng or know of ginseng buyers in the area. I’ve seen notices posted in the classified section of our local newspaper before, too. You can find ginseng in deep forests on north, west, or east facing slopes. It helps a lot to know the companion plants that grow in the same areas ginseng grows: black cohosh, bloodroot, doll’s eyes, maidenhair fern, Christmas fern, pawpaw, wild ginger. These plants are easier to spot than the ginseng itself. If you’re trying to find a suitable site for growing your own, it’s good to plant in places these plants grow if the site has sufficient shade. To buy seed, I suggest you get it from as local a source as possible. We get ours from Ozark Mountain Ginseng in Thayer, MO. We’re not in the same state, but we are both located in the Ozarks, at least. His seedstock aren’t originally from the Ozarks, either, but the plants that grow from them look just like the ones that grow wild here. Aside from that, seeds and plants produced locally are adapted to your local conditions and will more easily thrive. 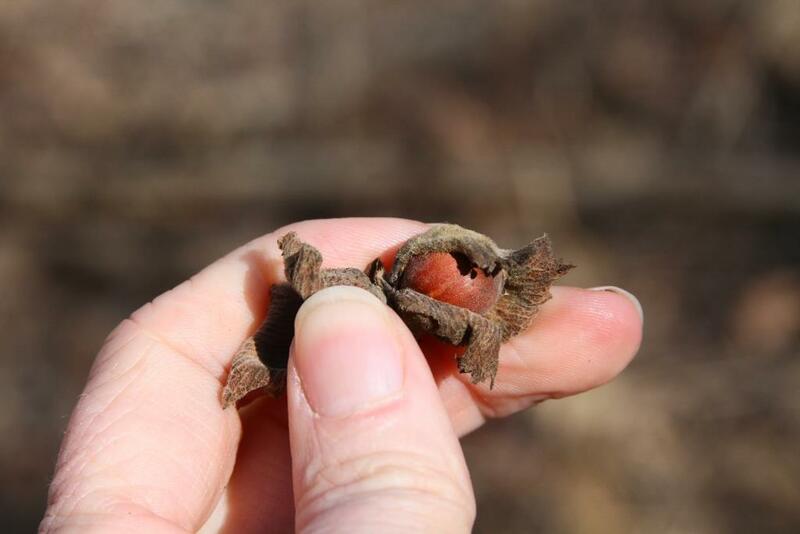 The topic of seed sourcing is one of the most debated questions about ginseng. Some believe a ginseng is a ginseng is a ginseng and that there is no difference between any of them. I believe there are distince local genotypes. I’ve heard that Wisconsin seeds do just fine here in the Ozarks, but I am concerned about genetic pollution and try to minimize the difference between the cultivars with my introduced seeds. That’s why I try to get a genotype of ginseng that is at least similar to the wild type we have here in the Ozarks. I believe Ozark Since it’s illegal to buy/sell/collect/trade wild ginseng seeds, this is the best I can do. How Long from Seed to Plant? Ginseng produces a berry in summer. In the berry there are two seeds. When the berry falls to the ground it takes a full year of sitting there before it sprouts the second spring after falling. When you buy seeds they’ll be stratified (usually). This means the seed has already waited the first year (usually outside buried in a bed or bucket of sand) and will be ready to sprout the spring after you plant it. The trees that ginseng grows best under around here is a mix of the following: oak, hickory, maple, pawpaw, dogwood, redbud, beech and poplar. 8. What happens when ginseng gets too much sunlight? Too much sun will bleach out the leaves making them turn whitish. Eventually the plant will die in these conditions but if the problem is confined to a small area, you can put up some shade cloth until the tree canopy closes in. If this is a problem in a large area, then the ground is probably too dry there and the site is not suitable for ginseng to begin with. 9. How to tell the difference between poison oak/ivy/Virginia creeper and ginseng? To the uninitiated, ginseng looks a lot like a few other plants. It’s most often confused with poison oak/ivy during first year growth because at that time ginseng only has 3 leaves. To tell the difference between ginseng and Virginia creeper, look at the leaves. Ginseng always has 2 tiny leaves and 3 larger ones (after the first year). All of Virginia creeper’s leaves are the same size. People send me photos all the time to ask me that, and I don’t mind helping out when I can. 99% of the time, the photo is of one of the common look-alikes and not ginseng. Every once in a long while, I’ll actually get a photo of the real thing and it’s exciting to be able to confirm that for the seeker. Check out my book about the most common look alikes. The cover is a quick-reference id key to plants often confused with ginseng. 10. When does ginseng come up in spring? It comes up here in northwest Arkansas in mid-April. Some years it will come up later, like it did this year (2017). It was May before they unfurled because the weather in spring was cold later and very wet. Sometimes a plant skips a year and will remain dormant until the following spring. Older plants sometimes stay dormant for more than a year or two at a time. 11. Does drought kill ginseng? If the summers are too dry, even if it’s growing in deep shade, sometimes ginseng will die back and go dormant until the following year when conditions improve. 12. Does ginseng still grow wild? Yes, although many diggers have carried seeds in their pockets and planted while digging, so it’s impossible to know which is true wild and which is virtually wild. This is most likely the case everywhere ginseng is native. That leads to another of the frequent questions about ginseng: What is the difference between wild and wild-simulated? It’s only how the seed was placed. If a person put the seed on the ground (or in it), then it’s wild-simulated. If nature caused the seed to make contact with the ground, then it’s wild. But then what about the offspring of wild-simulated that fall naturally? Well, it gets a lot trickier then, doesn’t it? I’d still call that wild-simulated, since it came from a human-seeded plant. In all other respects, though, it’s wild and will sell as a wild root (as will the other wild-simulated plants that were human-seeded). 13. Does breaking the tops off of ginseng hurt it? Will it come back next year? Short answer: Not too much, and Maybe. Although I’m sure having the tops broken off every year may not be good for the ginseng, if you do it late in the season after the berries have matured, it has some benefits. The main reason people do this is to “hide” the root from diggers. It would be better that the plant had the extra time with leaves to help restore energy to the root, but if poachers are an issue, it’s better for the plant than being harvested. Sometimes deer eat the tops off of ginseng , and sometimes I harvest only the leaves. But I’ve noticed that when a plant is browsed or harvested of its leaves, it has a tendency to go dormant the following year. Then it comes back the next one. I try to not harvest leaves from the same plant two years in a row just so the plant has time to fully recuperate. But if there are many poachers in the woods any given year, I would rather top them all than lose them all. Poster and other options available from RedBubble. Have questions about ginseng? Leave a comment and if I don’t know the answer I’ll try to find an answer. It’s been bone dry lately. This morning I brought my camera with me so I could take pictures of the driveway flowers. Ordinarily this would have been an “exercise walk” and I wouldn’t have brought the camera because that would have just caused me to stop and take pictures. Which would have defeated the purpose of the exercise, which is to get the heart rate up and sustained up for a little while. However, I’m still not up to my old self after the tick fever episode, so exercise isn’t “exercise” in the same sense of the word yet. Ha. So I brought the camera and called all the stooping and squatting “exercise”. Dogs waiting for me to catch up. It’s been so dry. We hadn’t gotten any rain for weeks and the trees are already dropping their leaves. Later in the afternoon, though, we did get a really nice shower. The creek isn’t flowing anymore and leaves are filling up the small pools. The water goes underground in the creek once it gets this dry. It leaves only a few small pools here and there. I have to check regularly to make sure the horses still have their usual water hole, but so far it’s never dried up in certain spots on their portion of the creek. When the water is low, it’s easier to find interesting rocks. This one has an inclusion that looks like part of a plant. Or something else. I’m not sure what it is, but it looks like a fossil of some sort. In spite of the drought, some of the driveway flowers are still doing well. Evening primrose blooming in the morning. Goldenrods never seem bothered by the droughts. Many people mistakenly think it’s the goldenrod causing their allergies. In reality, it’s the ragweed which blooms during the same time frame. I didn’t take any pics of the ragweed. It really messes with my sinuses and I didn’t want to get any closer to them than I had to. This one is called camphorweed, but it doesn’t smell like camphor to me. It plain stinks. It ought to be called stink weed instead. The latin binomial gives a good clue to its nature: Pluchea foetida. Camphor weed almost gone to seed. Down in Louisiana, when someone speaks of boneset, it’s usually Eupatorium perfoliatum. Up here in the Ozarks it’s usually a different boneset. This one is Eupatorium serotinum, or late boneset. This is the only boneset I’ve ever found in the Ozarks. I know that E. perfoliatum is an herb once used to treat “breakbone” fever, or dengue fever. I’m not sure if our local variety has the same properties. Once summer begins morphing into fall, the Lobelia inflata seed pods swell and ripen. I collected enough seeds of this plant last year that I didn’t need to gather more this year. It’s a valuable part of antispasmodic formulas I craft and really works quickly for muscle pain. Lobelia inflata with swollen seed pods. I wrote an article on this often overlooked plant for the North American Native Plant Society. It was included in the August 2017 issue of their members-only newsletter magazine called Blazing Star. I’m still waiting for my copy to arrive in the mail. I’m excited about this article because it also includes my drawing of lobelia and this issue is the very first color print version. A prettier kind of lobelia that grows here is the Lobelia siphilitica, or Great Blue Lobelia. This one would look nice in wildflower gardens, but they don’t do so well in drought conditions. The ones growing near the creek still look good, but these are beginning to suffer. The asters always look pretty no matter how dry it gets. Asters don’t seem to mind the drought. An asp on the asters. I found an interesting new to me flower on my walk this morning. Cuphea viscosissima has purple flowers with sticky calyxes. A small frail plant with purple flowers. The little hairs have a sticky sap globule on the ends. I’ve never noticed this plant here before and I’m not sure if that’s because it was never here, or because I just never noticed it. Of all the driveway flowers I normally pay attention to, this is one of the smaller ones I’ve ever noticed. It’s only about a foot tall, and fairly frail and the flowers are small. But the entire top half of it has little sticky hairs all over it. The seeds of this plant contains an oil that is being researched for biofuel and for use in cosmetics and food. I couldn’t find much about it on the internet, but it’s a member of the Loosestrife family. The common name is Tarweed, or Blue waxweed. It’s one I want to learn more about. Well, that was the end of my driveway walk. After taking that last photo I hiked my way back up the hill and didn’t stop again until I reached the house. In keeping with the “spotted” theme of my last post, here’s an orange spotted jewelweed flower. I’m always trying to get the perfect photo of this flower. A dream set-up would be when the sun is shining just *so* on it, to give the illusion of stained glass. There would be some nice glistening drops of water at least in the frame somewhere. In the meantime, I snap a pic when I see a pretty one. Later on as the plants begin to make seeds, I’ll try to collect some. Today I collected common milkweed seeds and some Echinacea purpurea. I’ll get these packaged up in some pretty way to sell at the farmer’s market soon. Perhaps next year I’ll be able to add our wild-simulated American ginseng to the list. This year all of the seeds I collected went back to replanting the hillsides.